Most humans don't realize that when they exchange emails with someone, anyone, they are actually exhibiting certain unspoken rules about dominance and hierarchy. The same rules regulate the exchange of grooming behavior in rhesus macaques or chimpanzees. Interestingly, some of the major aspects of human nature have profound commonalities with our ape ancestors: the violence of war, the intensity of love, the need to live together.While we often assume that our behavior in everyday situations reflects our unique personalities, the choices we freely make, or the influences of our environment, we rarely consider that others behave in these situations in almost the exact the same way as we do. In Games Primates Play, primatologist Dario Maestripieri examines the curious unspoken customs that govern our behavior. 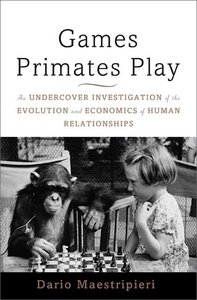 These patterns and customs appear to be motivated by free will, yet they are so similar from person to person, and across species, that they reveal much more than our selected choices.Games Primates Play uncovers our evolutionary legacy: the subtle codes that govern our behavior are the result of millions of years of evolution, predating the emergence of modern humans. To understand the rules that govern primate games and our social interactions, Maestripieri arms readers with knowledge of the scientific principles that ethologists, psychologists, economists, and other behavioral scientists have discovered in their quest to unravel the complexities of behavior. As he realizes, everything from how we write emails to how we make love is determined by the legacy of our primate roots and the conditions that existed so long ago.An idiosyncratic and witty approach to our deep and complex origins, Games Primates Play reveals the ways in which our primate nature drives so much of our lives.